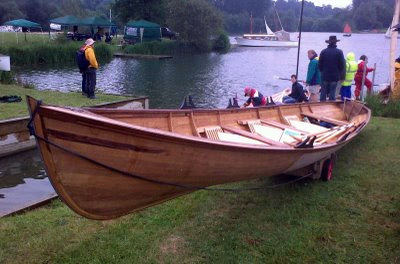 I wish I had been able to stay at the Beale Park Thames Boat Show long enough to have a row in Gecko, a 26ft three-man camping skiff built by furniture designer Ben Fowler and his son Dominic. She is shapely and made in an unusual and attractive wood - European sweet chestnut on 'tiger oak' frames. Ben says sweet chestnut is durable, light and stable, and that more boats should be made from it. Anyone know any cause or just impediment why boats should not? The outside is sheathed in epoxy and glass which gives the usual slightly milky finish. I tend to prefer either varnish on unsheathed wood, or paint over plastic, but each to his own. The hull is divided into three parts that can be unbolted to fit the whole thing in the back of a Transit - very handy especially for a 26ft long boat.